A few days ago, I was in my home studio, editing a voiceover project. It was a slow and easy day, when suddenly – my mom (and nanny) was rushing me to come downstairs! When I got to where she was, lo and behold – my little Ruby was right there… taking her first steps! Yayyy! She is starting to walk! All you parents out there can probably relate to that exhilarating feeling when your baby meets a new milestone for the first time. As we all know, most babies will first learn how to rollover, sit up, crawl, walk, then run. We are so used to thinking that in order for us to achieve things, there are “step-by-step” actions we need to do and that there are universal ways of doing them. While that can be true in a lot of cases, it isn’t always the case with becoming successful in a career or business (and yes, even in child development because every child is unique, but I digress). 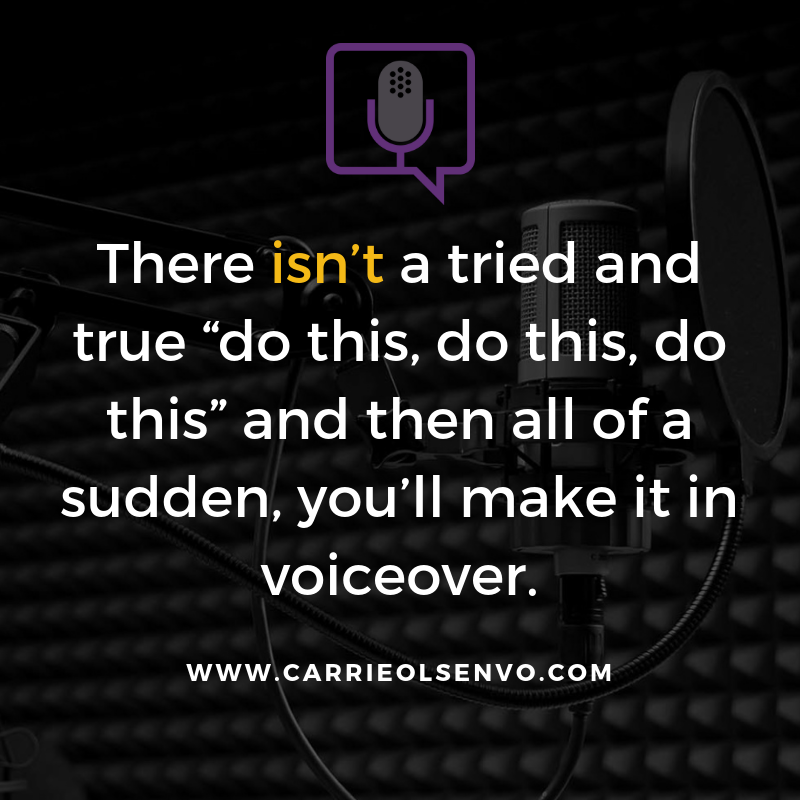 I’m often asked, “Carrie, how do I get started in voiceover?” – and am expected to give a step-by-step rundown of how to break into the industry. But it’s a really huge and broad question. In fact, if you talk to a bunch of different pros, you’ll hear all kinds of different entry ways and different paths that they’ve taken in their lives to get to where they are in voiceover. While I can tell you some things you absolutely should do, there isn’t a tried-and-true “do this, do this, do this,” and then all of a sudden, you’ll make it in voiceover. As an illustration, let’s say you wanted to become a restaurant owner and you know nothing about restaurants and owning a business – you probably wouldn’t send a Facebook message to a successful restaurant owner and just say, “How do I do this?” and expect them to be able to tell you everything you need to know in a quick, casual conversation. Firstly, you’d actually need to book an appointment with them and be prepared to get a sort of “college course,” right? And even then, you wouldn’t expect to leave the conversation fully prepared to open your restaurant doors. Secondly, if you’d actually be able to talk to a couple of restaurateurs, you’ll find out that they did things differently to get to where they are now. 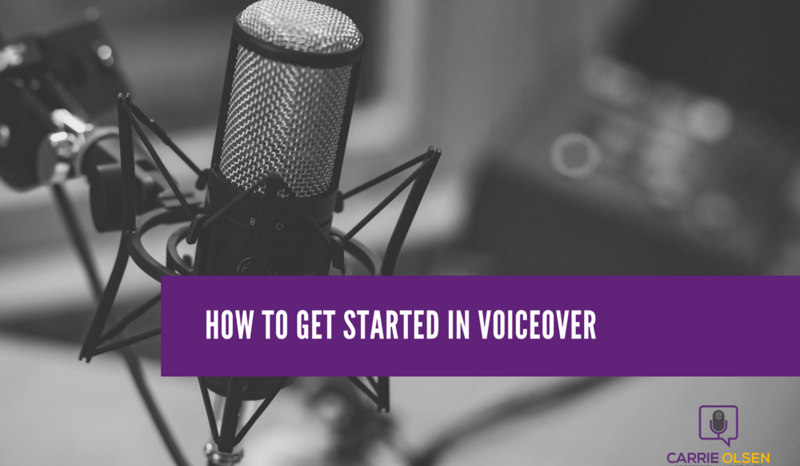 So back to how you can get started in voiceover, the same thing applies. While there are things that you need to make sure you’re doing, it definitely isn’t a one-size-fits-all, step-by-step pathway. It’s going to depend, and that is one of the reasons why coaching is so important in voiceover. That pathway is individualized. When I talk to aspiring voice actors who want to know what their pathway should be, we talk about their background, their ability, and even their goals – all of these things are unique to every individual and help us determine what their first and next steps are. So no matter where you are in your voiceover journey, coaching is going to be beneficial in deciding what step to take next – to make the process easier for you and to up your chances of achieving success. Think about the famous successful people who are so good at what they do. Even for them, coaching is a key ingredient to their ongoing success. Oprah Winfrey highly recommends to her viewers to get a life coach as she personally attributes some of her success to her own life coach, Martha Beck. Serena Williams, who constantly battled injuries, sought the guidance of Tony Robins so that she can overcome her challenges, continue training, and to persist despite the difficulties. Bill Clinton – yes, even a president – worked with Tony Robins as well. My short answer is — technically, yes. Are you going to be successful? Probably not. And if you are successful without a coach, I will guarantee you that it’s going to take longer than if you had a coach. You’ll most likely spend hundreds of hours trying to research, read up through a ton of resources, listen to dozens of podcasts, and enroll in several courses with varying levels of helpfulness (which actually also cost money) to figure out how to do things in the business. You’ll get overwhelmed with all the information you can get out there. You’ll have to decipher on your own how much of the information you got is actually applicable to you and is a match to your skills, experience, and goals. You’ll do a lot of trial-and-error on what equipment to use, how to land work, how to deal with clients, how to actually get paid, how to do marketing, and how to run a business that actually makes bank. Not to mention that you’ll likely end up spending a lot on these trial-and-errors. But if you really want to try doing it without a coach – go for it! Maybe you can’t afford a coach, or you think you can’t afford it, or you simply don’t think that you need one, or you think you’re that outlier who can do things on your own – by all means, go for it. My blog post “Learn Voiceover Without a Coach” is a really thorough resource on how to do just that. But if you don’t get burned out from trying on your own without seeing any results, you can always circle back and give it another go, this time with the help of a qualified coach. So as much as I would like to give a linear, universal blueprint that works for everyone, the most helpful piece of advice I can offer for getting started in voiceover is: Hire a coach. And I don’t say that because that’s what all the pros say, or because that’s what everyone told me when I was getting started. I say it because I’ve seen enough people trying to get started in voiceover both with and without a coach to know that your success rate is going to be just exponentially higher if you do have a coach. You’ll have industry-specific guidance on what steps you need to take based on what your experiences, skills, and goals are. You’ll spend less time doing research and guesswork because you actually have someone truly experienced and successful who will guide you. You’ll be able to spend more time doing things the right away, which means you are way ahead than if you’re fumbling your way through uncertainties alone. You can avoid making costly mistakes because you have pointed guidance. Basically: less time, money, and energy wasted; higher potential for success. So if you’re interested in voiceover – like you want it to be a part of your life someday and you want to make money as a voice actor – I want it to be something that you can actually do and get paid for. You see, beyond all the fun of being all these characters, there’s also a business side to having a voiceover career and it is just as important as your ability to perform. 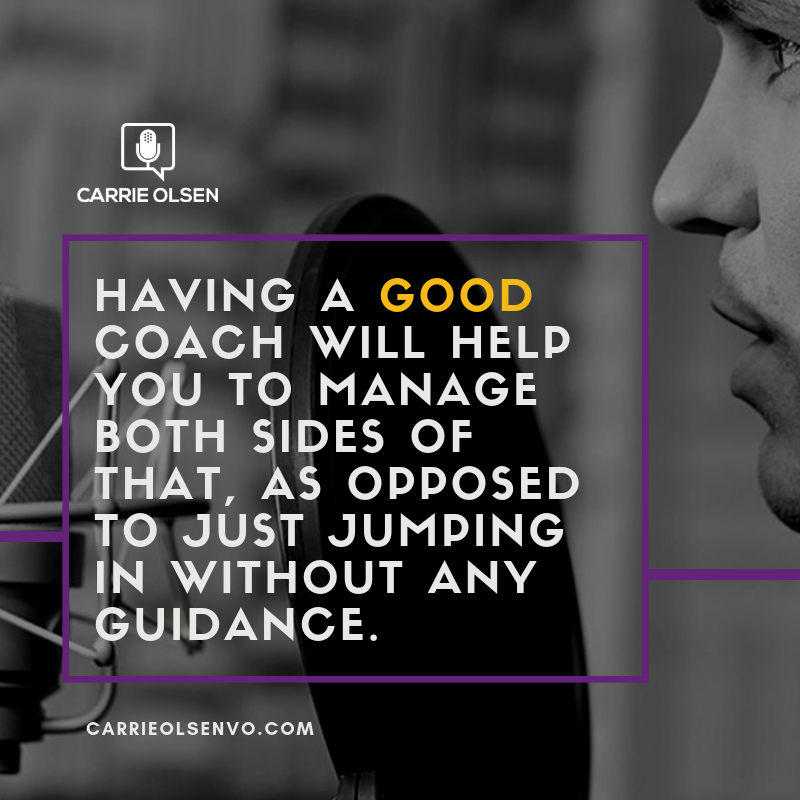 Having a good coach will help you to manage both sides of that, as opposed to just jumping in without any guidance. If you are interested in voiceover coaching and you’d like to kind of kick the tires on it before you decide if that’s something that you want to invest in, I’d like to invite you to listen in on a group coaching session. My voiceover coach, Alyson Steel, and I have one-on-one, as well as group coaching sessions that all happen online. We’d like to invite you to listen in on one of the group sessions to hear how they go. All you need to do is text VOCOACH to 44222, and I’ll send you information and get you setup to participate to listen in on a group coaching session. And lastly, I want to make sure I mention that I think it’s important that you vibe with your voiceover coach, and there are a lot of them out there. So please check around and make sure you’re comfortable with whoever it is you decide to train with. If you’d like a starter list of other coaches I recommend, here is a short list. to listen in on one of our group coaching sessions. I'm a full-time professional voice actor and voiceover business coach. I have done work for Taco Bell, REI, BNSF Railway, Bank of America and ESPN to name a few. I dreamed up this community of voice actors to connect, grow, learn and get mentorship from each other. We're the most dedicated group of voice actors on the net, and we're here to help each other build and sustain profitable voiceover businesses.